This simple Moist Chocolate Cake recipe is completely homemade and incredibly moist from using oil instead of butter! Seriously, it’s so easy to make and the best moist chocolate cake you’ll ever have! This recipe totally turned me into a chocolate cake lover! When I say that this cake turned me into a chocolate cake lover, it implies that I wasn’t before. But how could that be? Well, growing up, I was more of a vanilla or other fun flavor kinda girl. I think it’s because store-bought chocolate cakes just do not compare to homemade. They never really seemed worth it to me. But once I made this cake the first time, it opened up a whole new world of rich, moist chocolate cake to me. I literally cannot stop eating this cake whenever I make it. It is so moist and tasty, it should be illegal. 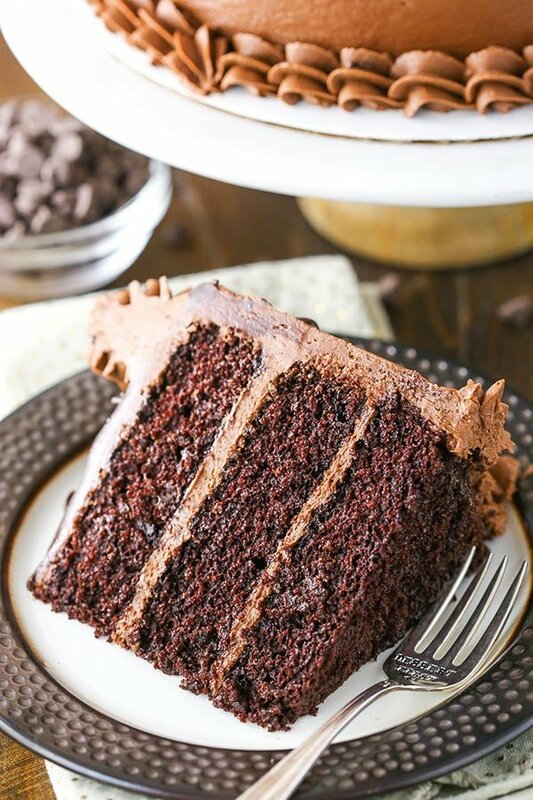 This chocolate cake recipe is so simple and easy to make, in addition to being delicious, that it has actually become the base for many other flavor combinations I’ve made and it’s always a hit! Nutella Chocolate Cake anyone? Baileys Chocolate Poke Cake? Mint Chocolate Chip Layer Cake, Turle Chocolate Layer Cake, Red Wine Chocolate Cake, Chocolate Oreo Cake and more. All made with this one easy chocolate cake as a starting point. I know there are so many moist chocolate cake recipes out there, but this one seriously is a must try. Not only is it delicious, it’s super easy. You only need one bowl to make it. Just whisk everything together and you’ve got your cake batter. Talk about en easy cleanup! This chocolate cake is also made with oil, instead of butter. It’s makes SUCH a moist cake! Additionally, I often make this cake with dark chocolate cocoa. It gives the cake an even more rich chocolate flavor. That said, regular cocoa works too and is also wonderful. One thing to note is that this chocolate cake has a very thin batter. And no, it’s not a typo – it’s a slow-bake cake and bakes at 300 degrees. I made this moist chocolate cake for my niece’s birthday last year. When it was served, one of the moms asked my sister-in-law where she’d gotten the cake. She pointed at me and the mom came over to ask me about it. Turns out she has two restaurants in Atlanta and was curious if I’d be interested in making cakes for her restaurant. 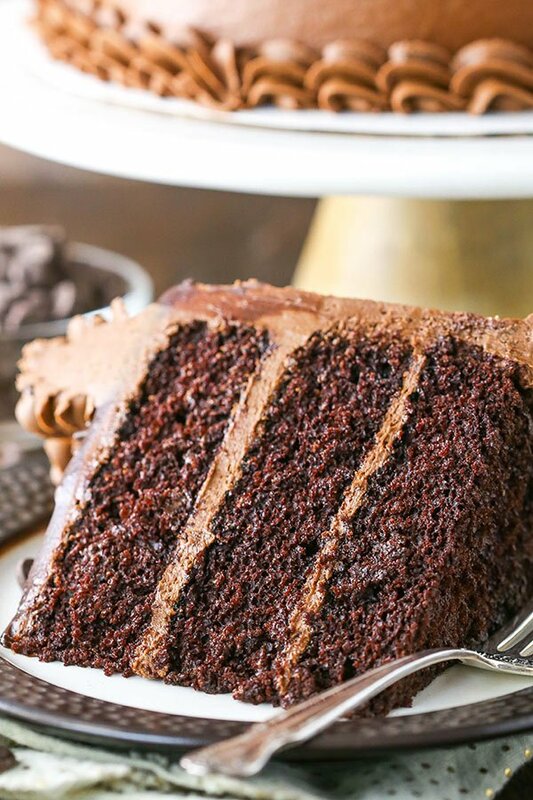 This Moist Chocolate Cake recipe makes the best chocolate cake you’ll ever make. Seriously. It’s so moist and rich in chocolate flavor! 5. Divide batter evenly between cakes pans and bake for 30-33 minutes, or until a toothpick comes out with a few crumbs. 7. Make frosting while cakes cool. Beat together butter and shortening until smooth. 8. Slowly add 4 cups (460g) of powdered sugar and mix until smooth. 9. Add vanilla and half of the water or milk and mix until smooth. 10. Add another 5 cups (575g) of powdered sugar and mix until smooth. 11. Add cocoa and mix until smooth. 12. Add remaining water or milk until the frosting is the right consistency. 14. Place first layer of cake on cake plate. Spread about 1 cup of frosting on top in an even layer. 15. Add second layer of cake and add another cup of frosting on top in an even layer. 16. Add final layer of cake on top and frost the outside of the cake. Feel free to use my tutorial for frosting a smooth cake. 17. To make the chocolate ganache, add the chocolate chips to a medium sized bowl. 18. Heat the heavy whipping cream just until it begins to boil, then pour it over the chocolate chips. Allow it to sit for 2-3 minutes, then whisk until smooth. 19. Drizzle the chocolate ganache around the edge of the cake, then pour the remainder of the ganache on top of the cake and spread evenly. I like to use a squeeze bottle for drizzling around the edges. 20. Allow the ganache to firm up a bit, then pipe the remainder of the frosting around the top edge of the cake and pipe a border around the bottom. I used Ateco tip 844. 21. Add a few sprinkles to the cake, if desired, then serve. Cake is best when well covered for 3-4 days. WOWZA!!! This cake looks so yummy!! I am glad I do not have this cake here right now because I think I would eat a slice for breakfast. Have a beautiful day!! Thanks for the great giveaways and congrats on the blog anniversary!! Thank you so much Janet! So glad you are liking the giveaways! Good luck in them! I made this as a cake before and it was delicious! I was going to try to make cupcakes out of this recipe instead, would you happen to have any suggestions on how to change the baking time/temp for this? Yes, my raspberry chocolate cupcakes actually use the same recipe (but cut in half) for cupcakes. Here’s the link. How do i do this chocolate cake into a 10 inc round and 2 layers? How much ingredients 2x or 3x? Hi! I was wondering what else can be used in the frosting to replace the shortening? Is this recipe able to be cut in half? Yes, you’d just want to probably bake it in a smaller pan or something. This chocolate cake is beyond amazing. No wonder you got offered a job! How do men eat one bite of cake and walk away? How?! Lindsay, Happy Blogiversary! I will definitely keep this recipe handy, but I don’t think mine would turn out as pretty as yours. Seriously friend, you are talented! Hi Lindsay, Happy Blogiversary. This looks like heaven on earth… I am going to try this the weekend. I just want to check with you on the oven temperature and baking time. You mention in the recipe that you bake at 300 degrees for 30-33 minutes. Then you mention bake for 45-50 minutes. Do I understand correctly that the 45-50 minutes is at a different temperature ? (after the 30 minutes @ 300 degrees) At what degree do you bake it for this period? Also, in case I use regular coco powder (not the dark chocolate) – is there a change in the quantity or do you use the same amount? Hi Marinka! Thank you for pointing that out – it’s baked at 300 degrees for 30-33 minutes. The 45-50 minutes was a carryover from something else and I missed it. It’s gone now. 🙂 Enjoy the cake! Hi, I’m not much of a baker, but I really want to make this chocolate cake. I know this is gonna be a stupid question, but is the flour self rising or not? It’s all purpose flour, but cake flour works as well. I made the cake exactly how specified and it sunk horribly. What was done wrong? It would be really hard for me to say without being there. If you opened the oven too soon before it was set, it would definitely sink. Also, maybe check the date on your baking soda to see if it’s still good. 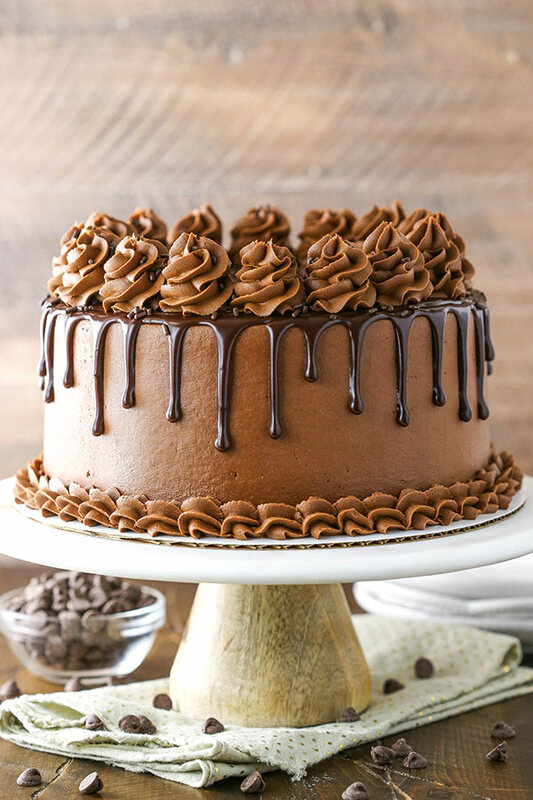 Oh my, that cake is just screaming chocolately deliciousness! I love all of your tall layer cakes and your pictures are just amazing! That looks delicious! I definitely want to try this soon! Thank you! I’d love to know what you think! Get outta here1!! If you tell me that you have some of this cake in the fridge at work, then I will be in my car in the next 10 minutes. This looks AMAZING!!! Pinned. I’ve never slow baked a cake before, so that needs to happen in my kitchen asap. One bite?!?! Inhuman is right. Thanks Lindsey! I actually made this cake a while ago and held onto it for this occasion. 🙂 New things the fridge constantly! Holy Shiz this cake is down right amazing. I am making this for Dell for our anniversary in September! Thanks lady! You have to let me know how you like it! Happy 2 years! I am also usually a vanilla cake person but, usually when I am craving chocolate, I want SO. MUCH. CHOCOLATE. 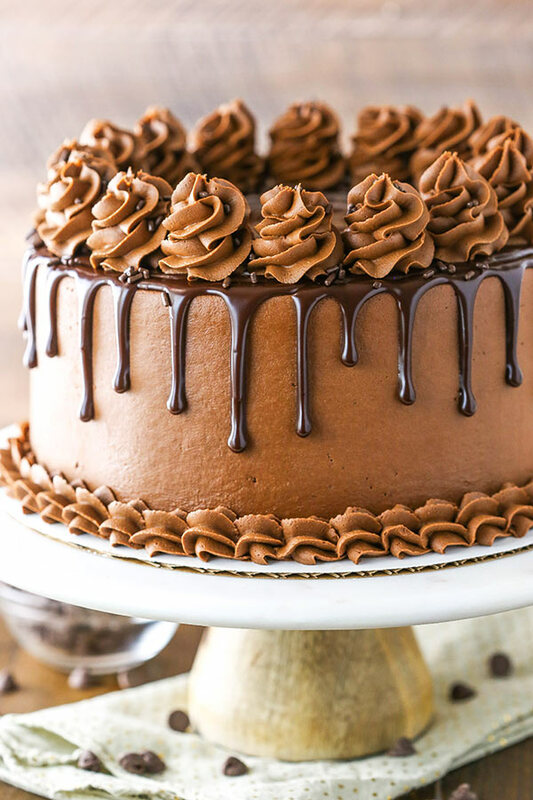 and this cake looks perfectly chocolately! Love it! And the giveaway sounds amazing, too, of course! Would love to win!! this is the most beautiful cake I’ve ever seen. WOW! Looks awesome and super chocolatey. Thanks Lina! Chocolate to the max! I will totally be trying this!!! Congratulations on the blog anniversary Lindsay!!! I am drooling over the cake!!! Looks so yummy. Must make. Thanks Carol! I hope you do make it – so good! Wow! Talk about chocolate overload!! This cake sounds amazing! That looks insanely delicious!! I have a really bad habit of eating all the cake domes I cut off or cube up for a trifle!! Pinned! what frosting tip did you use for the top? I believe it’s the Ateco 845 closed star tip. This is the kit of icing tips I use for icing cupcakes. What can I put instead of Hershey’s powder and buttermilk? Because I don’t have them in my country…. Any kind of cocoa powder you have access to should work, and you can replace the buttermilk with regular milk. Enjoy! I too don’t have herseys special dark cocoa powder. I have read a lot about the difference between the Dutch process and regular cocoa powder and the acidity that cocoa powder has compared to the Dutch process. Can you actually use them interchangeably in this recipe? If I was to use the Dutch process in the measurements you’ve provided would the taste be the same? Your cake looks amazing and I’d love to try it! The dark cocoa I use is actually a blend of natural cocoa and Dutch process. I’m not sure how using a full Dutch process coca would affect it. Girl this cake will be haunting my dreams!!!! And I can’t believe you have only been haunting this blog space for 2 years. You are a true star, professional and amazing baker who I am so glad to know and call my friend! I am so excited for all of your success and I know it will only get better! Have you ever replaced the hot water with hot coffee? My current favorite recipe does that and it has a very nice rich flavor. I have a very similar recipe that uses brewed coffee I stead of the water, and it’s fabulous! I am so glad I stumbled upon your website. I have been on the look out for a great chocolate cake. I have tried many homemade chocolate cakes but they don’t seem to do the trick for me. I can’t wait to try it because it may be “the one”. Thank you for being so generous and sharing your recipes. Happy Blogiversary!!! Thank you Elsie! I’d love to know what you think after you try it! I love you Recipes and pics I tired One Recipe with my mum it was sooo yummy and delicious. I can’t speak english soo good that Is why I can’t Write everything what I want to to say but happ Blog Birthday and happy Anniversary! This looks like the BEST chocolate cake. Oh the darkness of it! I’m drooling. Pinned! I’d love to pick your brain sometime and maybe get some advice? Oh my god! This looks A-M-A-Z-I-N-G! I’m definitely going to try this, thanks for sharing! Pinned! Thank you! I hope you enjoy it! Thanks for the pin! I’m curious about the 9 cups of sugar…isn’t that a tad bit too much? I feel like everytime I work with powdered sugar it comes out overwhelmingly sweet. The standard amount of powdered sugar for buttercream is 4 cups per 1 cup of butter/shortening. You can use less, but it will decrease the volume of icing. I believe I used most of the icing for this cake. Amazing on soooo many levels. I can’t seem to leave your blog. . LOVE this cake! This is in my oven right now! Will let you know after dinner how everyone liked it. The house sure smells delicious. YUM-MERS!!! can’t wait to try it. Can you only use this recipe for 3 8inch pans? or could you use it in a bigger cake pan and cut levels with a knife? I’m trying to make a tiered cake for my niece’s Sweet Fifteenth and I am so not a professional baker. I have a square cake pan for the bottom, round for 2nd tier and a heart for the top… I thought I’d make them and cut them into 3 levels each and use a strawberry mousse frosting in between. Am I crazy? Can I do this? I thought I’d give it a try with your delicious looking and easy recipe here. Any tips would be appreciated! Yes, you use other size cake pans, you just might need to adjust the amount of batter. I’ve used it in layered cakes before though – it holds up well. Hi. Did you choose a winner for this? Yep, I sure did! Hopefully I’ll have another great giveaway soon! This looks amazing! Think I will try it for hubby who LOVES chocolate cake! (He could probably eat the whole cake and he would still be “turn him sideways and mark him absent” thin. So jealous!, I just need to look at it and I’ve put weight on). One question though, can I substitute shortening for butter? If so is it still the 1 1/4 cup? To be honest, I don’t even know what shortening is, we don’t tend to have it in recipes in New Zealand. My husband is the same way – never gains a pound! Not fair. 🙂 You can definitely use all butter in the icing. You’ll use 2 1/2 cups total of butter. This cake is yummy!! It’s the recipe I use too. I read once that this is a very old Hershey’s recipe. Very popular. That’s very possible Roseclar – I hadn’t heard that. It’s always a hit though, thanks! I actually use this icing smoother. This cake looks incredible! I am wondering what the baking time would be for cupcakes. I usually bake them at 325 for about 18 minutes. Thanks Bree! For these cupcakes, you want to bake at 300 for 20-25 minutes. This is almost exactly the recipe my mom had and I’ve been making for 35 yrs starting with my first failed attempt at 10 or 11. Back then she used shortening but I use only butter. It is the best chocolate cake recipe ever! My question is if i use tihis chocolate icing can i cover with fondant? I have to make a chocolate cake with a chocolate icing i like to try your recipe!! Yes, you can cover this icing with fondant. I have done it before. If you want really sharp edges though, I think ganache works best under fondant. Can you let me know how long i should bake??? I have never made it in an 8×12 pan, so I’m not sure. I’m sorry Monika. I’d try at least 20 minutes, then watch it. What about a 9×13 sheet cake pan ? How long for that? I haven’t baked this in a 9×13 pan, so I’m not sure. I’d recommend at least using two pans. I’m not sure how it’d bake all in one 8 inch pan. You could do it as one layer in a larger pan – maybe a 12 inch? Did you use cake flour or all purpose flour??? You can actually use either without changing anything else. I’ve used both, but I used all purpose flour for the one in the photos. Happy blogiversary Lindsay…Thanks for sharing your recipes to your readers…They all look heavenly delicious and doable… Makes me want to try and bake them all! Hi i am surprized it doesnt have any baking powder .unless u use the cake flour and i dont think i read that.! !can u plz specify what us youe leavining agent to raise rhe cake?? Hi Ahlam! Yes, it uses baking soda, not baking powder. I made this cake without the icing and it was amazing! It was very rich and moist. It was a hit with everyone. So, I’ve got this co-worker that makes the most amazing baked goods – so amazing that when she bought a new house, the only fitting house-warming gift we thought appropriate was a new Kitchen-aid Mixer. Why am I telling you this? Because she always makes obnoxiously amazing baked goodies for each of our birthdays. When it came to her birthday, I knew I had to make something amazing for her. It was getting close, and I was at a loss. The other day, I found this cake in my FB feed, I knew I had to make it! This weekend, I made the cake and brought it in this morning. To say people loved it is an understatement. Most of the words used were 4 letters words and not PG-13 (but in a totally good way! ) Here are a couple I can repeat: “Sweet Jesus!! Your cake is awesome!” and “I will have dreams of that cake .. . . just perfect.”. I already have about a dozen “orders” for upcoming birthdays. So, thank you for helping me make a cake that is amazing enough to show my friend how amazing she is. What a great review Stacey! 🙂 I’m so glad everyone loved it and you were able to share it with your friend! Hi, I’m from Australia and wanted to clarify if it was 300 degrees Celsius or Fahrenheit? The cake looks great! 300 degrees CELSIUS?! Are you serious? Sorry I missed your joke Camellia. I do sometimes get questions that I’m not sure if they are joking or not and I certainly don’t want to insult anyone. Hey! I absolutely love your site and I just made the cake and the flavours are great but the cake just fell apart when I was frosting it. I don’t know what happened. One second everything is fine as I am frosting and the next second, boom, it’s falling apart. If you could please help me figure out what I did wrong? P.S. If I haven’t mentioned how much I love your website, I have to say I absolutely adore it. Thank you Amna! I’m glad you enjoy the site. I’m so sorry you had trouble with the cake. It’s definitely a moist one. When you say it fell apart, what do you mean? Did the cake split? If so, did you cut the domes off of the layers? Hi-I did a lot of research on this matter and I think that maybe a few of the readers who had trouble with the cake rising properly may have used a purely Dutch Processed cocoa. Hershey’s has (had) a “Dutch Processed: Special Dark Cocoa” (with a metallic label on the top) as well as their current/updated “Special Dark Cocoa” which is “a blend of natural & Dutched cocoa.” Dutch processed cocoa is more alkaline than natural cocoa, and will not react with baking soda to rise. (Generally, dutch processed cocoa requires baking powder to rise.) Because buttermilk is one of the ingredients…if someone used purely dutch cocoa, perhaps there was enough of a reaction to cause an initial lift but it wasn’t stable enough of a reaction to remain risen. When using a recipe with baking soda only or baking powder only, the type of cocoa matters! Hershey’s Special Dark blend may be somewhat forgiving since it contains both but anyone who deviated and used a purely dutch cocoa powder in addition to submitting the buttermilk may have run into some major problems i.e. a sad, droopy, tastes-like-soap-cake. I just came across your blog and saw this amazing cake. I will be making it ASAP! How, oh how, do you get your icing so smooth and the edge so sharp?!? Thank you Karen! I’ve been meaning to do a tutorial – I get that question a lot. 🙂 My favorite tool is this icing smoother. I hope you enjoyed the cake! Hi Patty! You can actually use all purpose or cake flour. I’ve used both and they both work great. You don’t have to change anything. The version in the photos is all purpose flour though. You can replace the shortening in the icing with butter, if you prefer. If only using 2 cake pans, I believe you’ll bake them for 45-50 minutes, but it could be a touch longer. Hi! Congrats on the anniversary. I was wondering why the shortening in the frosting versus butter? Is it taste, texture or ability to store cake at room temperature longer. Also, how do you store it? Have you ever made this the day before the event? Thanks! I personally prefer the taste. I think all butter tastes too buttery. But I also like the shortening because at warmer temperatures, it won’t melt as quickly and holds up better. Before icing a cake, I usually store it in the fridge, but once on a cake or cupcakes, I leave it out since I don’t like to refrigerate my cakes. And yes, this cake is very moist, so it can be made a day or two ahead of time and still be moist and fresh. Hi! Just made it. Made cupcakes and it yields appx. 30 cupcakes filled 3/4 way. The batter was very runny and cake didn’t rise really. Baked at 300 for 20 min. But, the cake was so yummy that my two kids killed 6 of them before they cooled or had frosting on it. The frosting was abundant for cupcakes, I would half it. Everyone said the frosting was way too sweet. I only used 8 cups too. How can you make it less sweet? Thank you! Butter flavored shortening is a great compromise. I don’t eat cake too often because I’d be as big as a house. But when I do, I love a simple homemade recipe using fine ingredients. So I must try this! Great blog, Lindsay. If I could eat sweets and still look like you I’d make them a staple and not just a treat! Made this cake a couple of days ago and the husband and I have almost completely finished it! This will definitely be my go-to recipe for chocolate from now on! We love it! I made this cake for my birthday and it has to be my favorite homemade cake ever! The frosting is just delicious!! I’m so glad you liked it Alex! Thanks! Do you handmix this batter, or do you use an electric mixer? I use an electric mixer. I have been looking for a good chocolate cake recipe. All the ones I make turn out so light, not dark and rich looking like this one. Can’t wait to make it and devour it with my bare hands!!!! I learned from a well known NY baker that after you take your cakes out of the oven, immediately use a clean towel, place it over the cake pan and gently press down the raised dome on the cake until it is even. Works every time and no cutting is required. Thought I would share this. Thank you so much! That comment just salvaged my cake tops ???? Yesss!! I have been looking for a recipe as close to my bf’s old family recipe for hot water cake. We have never used boiling water, simply hot water from the spicket, but I will boil it, don’t wanna mess up. I am so mad can not find where I scribbled the family recipe. Only thing, I am going to use olive oil, don’t have vegtable oil. Should be alright, I often do that. I’m glad you found this recipe – I hope you enjoy it! If I only add 4 c of powdered sugar, would the butter and shortening need to be adjusted also? Yes, you’d probably want to cut the recipe for the butter and shortening in half then. The powdered sugar is what gives the icing it’s volume, so if you only use 4 cups, you probably won’t have enough icing to fully ice the cake, unless it’s a very, very thin layer. 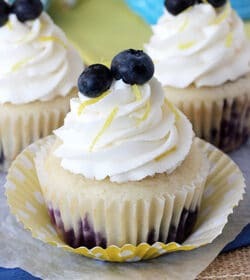 I just made this recipe but made cupcakes…..they are so pretty..lol. Making a cake tomorrow, but was curious if you have a whipped chocolate icing recipe that would taste good. I have some family who don’t like the taste of shortening in butter cream and prefer a light, but chocolaty icing. Lindsay, I just want to say that I used this recipe to make cupcakes tonight and they turned out FABULOUS!!!!! They are so moist and really don’t even need frosting!!! This is definitely my permanent chocolate cake recipe from now on!!!! I am trying to start my own cake making business out of my home and this recipe just boosted my confidence…….this coming from a girl who never made a cake from scratch, but not anymore!!!! !My mom used to have her cake business and I can’t wait until she tastes your recipe!!! Thanks for sharing!!!! Thanks Nicole! That’s great! I really love this recipe! Good luck with your business – how fun! this looks delicious! I was wondering if instead of making a cake I could do cupcakes with this recipe? How long should they be in for? I’m making them for a wedding shower. Yes, you can do cupcakes. They’ll bake about 20-22 minutes. Lindsey, I liked your chocolate cake recipe so well was wondering if you have yellow cake or white cake recipe also? If they are as good as this chocolate recipe then I would love to have both please. Thanks in advance! and I bake it twice(cus i made a double layer for my hubbys fathers birthday) and allthough the dark chocolate tastet sooo good (and my god i landed in heaven) i had to use normal cocoa powder that I use for my daughter it STILL tasted great! So my question, I`d like to share this in german, and i would of course set in your webpage and there wouldn´t be a question that this is your creation. Would you mind terrebly? I’m so glad it was a hit! I don’t mind at all if you share it. Thanks! I can’t find the actual recipe on this post. It looks delicious & I would love to have the recipe. Thanks. Hi Susan! I’m not sure why you’re unable to see the recipe – I can see it fine. I will email it to the email address associated with the comment you left though. Just let me know if you have any other questions. Thanks! I’m asking for my wife who pinned this article because she wanted to use the recipe, but she told me this morning that the recipe is no longer in the article. I’m noticing the same thing now myself? Can some one help us out here and post the recipe for this chocolate cake as a reply? Hi Andrew! I’m not sure why you’re having trouble seeing it, but I’ll go ahead and email it to you. Thanks! Hi Lindsay! I was wondering, could you use your chocolate cake recipe and and make a vanilla cake out of it by omitting the cocoa. I love your chocolate cake recipe and no other vanilla cake recipe comes even close to being that good!!! Thanks in advance!! I don’t have dark chocolate cocoa powder. Will regular unsweetened cocoa powder work? Thank you so much! Can’t wait to try this out! This turned out great 🙂 Thanks for your reply! I made this for a birthday cake for my Uncle on Friday and it came out sooo good that Im going to be making it today again for the Super Bowl for my party! Thank you for sharing!! Made this cake for Super Bowl! This is my new chocolate cake recipe! I might double it next time because I like my cakes a little thicker. I used 3 8 in cake pans and they were done in 25 minute! I only have 9-inch pans. Can I use this instead? Thanks! Yes, but if you use three 9 inch pans, you’ll probably need to reduce the baking time a bit. Probably around 25 minutes. Can I substitute the Hershey’s cocoa powder with regular unsweetened cocoa powder? I’ve never made it as a half sheet, so I’m not sure. I’m sorry. HELP!!! What am I doing wrong??? 300 degrees for the specified time, the cake was not nearly done. It had to cook for about an hour and the cake turned out gummy. What might I have done??? Been cooking for 60 years, so it is not like I am a beginner at trying new recipes. Any suggestions?? Hmm, it’s really hard for me to say. I’m sorry it didn’t turn out. I’ve made it more times that I can count without a problem. Maybe some of the ingredients were off? I really want to make this cake but I only have cake flour. Can I use 2 cups of cake flour instead of all purpose flour or should I use 2 cups of cake flour plus 2 Tbsp of cake flour? And would I have to sift the cake flour. You can actually do an even swap with the cake flour. Just use 2 cups. I’ve used it before and it works great! I don’t usually sift it, I just give it a quick whisk. I was asked to make chocolate cupcakes as a take home favor for a baby shower. I’m going to use your dulce la leche frosting on them. Apparently this is what the baby is asking for… Do you know about how many regular size cupcakes this batter will make? I need about 50. The mother has asked for “chocolate coma cupcakes”, and this will definitely fit the request. Thank you for your help, and here’s to many more years of your wonderful baking and stories. It should make about 24 cupcakes. You might be able to get about 25, so that you can double it for 50. I was wondering if you might have advice if I did this as a 13 x 9 layered cake. Do you know how long I should cook it for, should I double the recipe? it looks amazing. My son wants chocolate cake for his birthday and I think this would be fantastic!!! Thanks so much for the inspiration!!! I’ve made this cake a ton, but never as a 9×13. I need to try that. I don’t think you’d need to double it. One recipe should be fine. One and a half at the most. I ended up tripling the recipe to make two 9 x 13. I made a big layered cake for my son’s birthday. It was absolutely delicious. Incredibly moist and just so yummy. It was perfect because I was able to make it a couple of days before hand, and kept it in the fridge so that it was still super tasty and moist two days later for his party. Thanks so much for the recipe. It will definitely be made again!!! Came across this recipe in my fb news feed today and really want to try it for a fundraising event end of next week – looks like it will bring in some pennies for charity, (probably from me buying every slice!!! haha). I’m in England and not sure what you mean by shortening? For example, usually shortening in pastry is lard – but surely can’t use this in frosting? I think there are vegetarian alternatives, would this be the best alternative? Or can you suggest something else that might be similar? Hi Jo! Shortening is a butter replacement here. You can just use butter to replace it. Good luck with the fundraiser! Hi! I just found this on Pinterest and I was wondering, do you think this cake would freeze well? I’m preparing to make an ice cream cake and looking for a good batter to use for the cake part, and this recipe sounds amazing! Do you think it’d work well for an ice cream cake? Thank you! Yes, it’d be great for an ice cream cake. I’ve used it for one before and loved it. The cake certainly looks yummy and easy to make, but 3 layers seems a little too tall for about 4 people. How do I reduce the quantity of the ingredients for 2 layers in 8″ pans? You could try cutting the recipe in half, but I’m not sure if that’s what you are trying to achieve. This is one of the BEST chocolate cakes I’ve tasted! This will be my go to chocolate cake from now on! Thank you so much Michelle! I’m so glad you enjoy the blog and recipes. 🙂 I actually would love to do just what you suggested and share some secrets with my readers. I’m hoping that I’ll be doing that very soon. Stay tuned! Hi…. i saw your blog through someones page in facebook…she linked a recipe you made, it was just one recipe and instantly i became a fan. Anyways continue making beautiful and delucious sweets. GOD BLESS! I’m so glad you found the blog! How sweet it is would probably depend on who you ask. I definitely have a big sweet tooth, so it’s possible you’d find it a bit sweet. Overall though, I’d describe this cake as more chocolatey than truly sweet. Hi Lindsay!! I am making a 3 tier wedding cake and they want it chocolate. This recipe is my go to for chocolate cake. It’a so good!!! If I’m making a 6″, 12″ round and the middle being a 8″ square, should I make this recipe 2 x’s…….right? Thanks in advance!! I imagine you’ll need to make several batches for all three layers, but I’m not sure exactly how many. Nice recipe but may I ask, how many grams in your cup? I just measured and it was about 140 grams. Thanks. I baked the cake and it was AMAZING!!!!!! I have made this cake three times, and it is beyond DIVINE!!! It is so moist and absolutely amazing. I made it yesterday for an Easter dessert with a different icing, but OH.MY.GAWD…I couldn’t get enough. Furthermore, I have made several of your other desserts, as well, and they have all been exceptional. Keep up the good work! Thanks so much Kimberly! I’ve glad you’ve enjoyed everything! Holy. Cow. I made this cake for Easter and I can’t get over how delicious it is! While mine didn’t turn look quite as nice as yours (maybe a future post on tips for icing a cake? ), it didn’t even matter once you took a bite! Definitely my new favorite! Can this be made into 2 8inch cakes instead of 3 successfully? Or make 2 with less batter abd use the extra from the third to make cupcakes? Yes, it can. I can’t remember the exact baking time, but they’ll just bake longer since they’ll be thicker layers. The first time I made this it was perfect! But the second time it fell flat and wouldn’t cook all the way. Was the water too hot? And, is this batter suppose to rise much at all? Hmm, strange. It shouldn’t have been an issue with the water. Did you perhaps open the oven door too soon? That can cause the center to fall and not bake correctly. The batter does have what I’d say is a normal rise. It is a very soft cake, so you do have to be careful when working with it. This may be a silly question, but did you remove the cake domes before stacking it? I know some people don’t do that and because this cake is so soft, it probably would fall apart if you didn’t. I also have a cake lifter that I’ll use sometimes to lift and move the cake around, which can help. Looks tasty. What can i replace with shortenig? You can use additional butter in place of the shortening, if you prefer. I’ve made this cake several times now. It’s always a huge hit at parties and potlucks. Thank you! I made this today, only I made cupcakes. I didn’t have the dark chocolate so used the regular kind. I also used hot strong coffee instead of the water. Turned out wonderful!! Thanks for your inspiration! Oh please stop putting Crisco or solid shortening in your recipes NOT good for the human body do not feed to children. You can put it on your wrist it does not melt at body temp. leave it on a shelf no bugs will touch it and it will stay forever..PLEASE stop using this in food. Hi, I started making this today but I don’t have vegetable oil… do you think butter or olive oil would work as a substitute? I believe I’ve tried butter before and it didn’t work well. Olive oil would be a better bet, but since I haven’t tried it I don’t know for sure how it’ll work. WOW! Best cake ever, and I didn’t even frost it…just wanted to taste the cake alone. Game changer! Couldn’t get my hands on all of my 8″ cake rounds, so I made this as a bundt cake. Just added about 15 min to the cook time. Delicious! Can’t wait to try it as the real, frosted version. Thank you! Hi, Lindsay, I really want to make this cake for a friend’s birthday this Friday and I only have 2 9-inch pans. I calculated the thickness, if I were to use these pans, to be ~1.2 times the thickness of your cake layers. These pans are also only 1.5 inches tall, instead of 2 inches. Could you tell me how thick (about) your layers are, so I can make sure my batter doesn’t overflow? Also, any tips on different baking time and stuff would be appreciated. I honestly didn’t measure quite how tall they are and would hate to give you a wrong guess. It might be close. I have 2 and 3 inch tall pans. I came across this recipe looking for a wedding cake for my sister. I halved the recipe to test it, used cake flour, and poured it all into a 9″ pan, but followed the rest of the directions. I just took it out of the pan, and it seems way too soft to be stacked and peels off when I touch it. Do you know what I could have done wrong, or how to fix it? What do you mean by peeling off? It’s definitely moist and crumbs can come off. I’ve stacked it many times and used it with fondant as well, so it should be fine. I don’t usually refrigerate it, but you certainly could. I made this chocolate cake for my family a few weeks ago. It is the best chocolate cake I have ever made or eaten. It is a very moist cake and very chocolately but not overpowering. This is my now go to for a chocolate cake. Definately a keeper. Thanks so much for sharing. I actually have used powdered buttermilk in this cake and it works great. Just add the powder with the dry ingredients and the water in place of the milk. The other alternative is use regular milk, which works well too. Hi! How would you change the baking time if you made this in 2 9inch cake pans? Thank you! If I remember correctly, it’s about 40-45 minutes. I absolutely love your blog and I have tried a few of your recipes and they are all awesome. I do have a question about this recipe. I’ve made this cake twice and each time the cakes never rise as high to get a nice tall cake. I even weigh my plans while filling them to make sure each pan has the same amount of batter. Could I add some baking powder to help them rise? Any suggestions? Thanks for sharing your fabulous recipes!! By the way this cake has been a hit everytime and beat out a store bought 9 layer chocolate peanut butter cup cake this Thanksgiving because it was so moist! When you say they don’t rise tall enough, do you mean that the individual layers of cake don’t rise in the center enough and have a nice dome on them? Or do you mean the cake isn’t as tall as you’d like it to be when all put together? The cake should be between 3 and 4 inches tall once it’s iced and put together. I made the chocolate cake layers for my daughter’s wedding cake but filled and frosted it differently – she wanted raspberry filling and white frosting. The chocolate cake was so moist and delicious it was unbelievable! It was the best wedding cake I have ever had if I say so myself! I baked one recipe in two 9″ pans and then made half a recipe and baked it in one 9″ pan (I only own two 9″ pans). I also used the Magi-cake baking strips around the pans and the layers came out perfectly flat. I froze the layers until the night before the wedding when I completed the cake. Is this a buttercream frosting or an icing ? I am confused as I’m not a baker but wanted to bake a cake and pipe some rosettes on but I’m not sure if this frosting would hold since you are saying its icing. I read that buttercream would hold intricate designs better. If anyone can let me know that would be great. I was also planning on putting some fruit between the layers, any suggestion on how and if that is a good idea? It’s a buttercream frosting and would be great for piping. Putting fruit between the layers should be fine, just be sure to either cover them fully with frosting or to pipe a rim around the outside edge of the cake (and filling it with the fruit) or you could end up with some moisture seeping out of the middle. This looks like an awesome recipe!! Quick question: can you make this with two 9-inch pans instead? Yes, you can. You’d just want to make the layers a little less time, I just can’t remember how long. Hi Julia, I have updated the recipe with those measurements. Thanks! Is baking soda the same as bicarbonate of soda? We only have baking powder or bicarbonate of soda in UK…. Going to try this, this weekend as a birthday cake. 300f is only 148c for UK, I should’ve checked instead of reading the comments. Cake burnt…. Should’ve listened to the wee voice in my head. I wondered at the slow bake comment when oven was so high. Glad I’ve got double quantity to start again ???? Oh no! I’m sorry! I’m slowly going back and doing updates like that. I just updated this one. I typically use all purpose flour, but this cake can actually be made with cake flour as well. I am going to attempt this cake but I was wondering how you’d suggest storing this cake. I get so nervous with the fridge. I recently made a cake that turned out good and I had to store it in the fridge because of the cream cheese frosting. it just did not taste the same when i took it out. Any suggestions on successfully storing a cake in the fridge without it getting a weird taste? And is this chocolate cake ok to leave out but covered? Sorry so many questions, im stuck! Refrigerating cakes isn’t my favorite, though I know it’s necessary sometimes. If you felt like there was a weird taste after refrigerating, it could be that it was in the refrigerator with something else that had a strong flavor and the cake absorbed some of that other flavor. To avoid that, make sure it’s well covered. I also find that refrigerating cakes makes them dry out quicker. Also, cakes are typically best at room temperature, so if you refrigerate a cake it can often be best if you let it sit out for a bit before serving. With this cake, you don’t have to refrigerate it. I don’t. I actually do have a tutorial. 🙂 You can check it out here. Hi How are you? lovelly recipe was drawn to your website through pinnterest. i stay in Namibia and we use different metric values like 1 cup is 250ml here, how can i modify your recipe and i cannot find any super dark cocoa just regular one this side. Holy Shiz!!! I’ve been a hobby baking for a while now and is always on the look out for new cakes to make. I’ve been looking for a cake this dark, both frosting and cake, for a while! It looks tremendously delicious. Quick question, though. I only have 9″ cake pans. Do you think I could use two 9″ cake pans as opposed to three 8″ cake pans? Thank you for making this cake. Yes, you’ll just need to adjust the baking time. I love this cake but the frosting comes out to thick. It is the best tasting cake ever, but I have a really hard time with the frosting since it is soooooo thick. hi, your best chocolate cake is so yummy. I made that so many times. 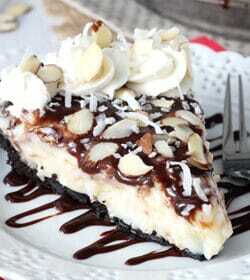 need your help to make that without coco powder. 3/4 cups. so please tell me what to add instead of that 3/4 cup of coco powder. I need that recipe. I’m not sure this cake would work well without the cocoa. I’ve tried it myself and it makes a very different cake. If you’re looking for a good vanilla cake, I’d suggest trying this one. WOW!!! This was one amazing cake. My son wanted a s’mores birthday cake, so I used this recipe for the cake and icing and topped with toasted marshmallows and dusted the sides with graham crackers. The one thing I wanted to point out is that in the recipe is states to cook the cake for 30-35 minutes. I had to actually cook the cake for 45-50 minutes. Other than that, this will definitely be my go to cake when I am need of a chocolate fix!! Me tooo i had to bake it for 20 min extra than the time indicated. I think it’s cuz our oven isn’t as hot or it’s a very slow cooking process (150 degree celcius is very low) with a large quantity of cake. Other than that it turned out great! but i used normal cocoa instead of the dark one since it’s not available where i live 🙁 was still good but i think it would’ve been 10 times better with the dark cocoa. BTW I LOVE UR RECIPES THEY R SO CREATIVE AND ON POINT FROM THE INGREDIENTS TO THE METHOD TO EVERYTHING ELSE!!! Thanks for sharing it with us. One question though….. have u done any culinary classes or have u always baked on ur own? I have never successfully made a homemade cake! Before I try to make this delicious looking cake, does it normally turn out more dense or fluffy? It should be quite fluffy. I would like to make this for a birthday cake but I do not have access to the Hershey’s Special Dark Cocoa powder. Could I use regular Cocoa powder instead? Hi! I know it says you would recommend using the dark chocolate rather than the regular, but I was wondering if using regular cocoa powder would mess it up. And also, if I am using a 13×9 pan would I just vary the baking time? Regular cocoa will not mess it up. And yes, you’ll need to adjust the baking time. I haven’t baked this as a 9×13 so I’m not sure how to advise. Can i ask you if it is possible to bake sponge in only one pan and then divide it? Or fudge cake is really hard to dividing? I finally got up the courage to give this one a go. I couldn’t believe how easy it was!! I took it to work for a co-worker who wanted “something chocolaty”. I’m not the kind to pat myself on the back but this might be the best dessert I’ve ever made. All of my co-workers (I’m the only male amongst 10 females) want this for their birthdays. I have always enjoyed making cheesecakes but this beauty is my new favorite! Awesome! 🙂 Yes, it’s SUCH an easy cake and definitely still my favorite chocolate cake. I’m so glad it was a hit! I made this cake for a luncheon at work..truly the best chocolate cake I’ve ever made…everyone raved about it. I made it into 3 layers …between the layers I had raspberry puree and cream cheese frosting ( tinted pink). and the cake was topped with piped frosting, fresh raspberries and drizzled chocolate..it looked and tasted amazing.. I skimmed the comments and didn’t see anyone ask about adjustments for high altitude. I’m in Colorado. I’m planning to make this for my sister’s birthday next weekend. It looks amazing! I’m sorry but I don’t have experience with high altitude baking so I’m not sure how to advise for that. Carly, I also need to adjust for high altitude. I live in Albuquerque, NM and our altitude is almost exactly that of Denver. I finally found a site that has been a godsend! Go to this web page for Arthur Flour http://www.kingarthurflour.com/learn/high-altitude-baking.html I use the pointers on this page for every cake I make and have had no issues since finding this site. I sit down with the recipe and the information they provide and make the adjustments for every ingredient before starting the recipe. Truly you will will be so thankful. They also recommend publications from Colorado State University in Fort Collins. Good luck baking! Patricia-I found this information shortly after moving to northern NM and it is a baking life-saver! Baking at 7,000 ft is a challenge!! Did someone figure out the adjustments for high altitude? I am making this in two 9″ pans for a wedding cake, but when I tried it, the middle really fell. I did not open the oven, and cooked it a little longer, and it fell even more. I have a friend whose favorite cake is chocolate cake with chocolate frosting. I’d like to suprise them with if for their birthday next week. Do you have a less sugary chocolate version? And could I make this ibto a six inch cake? I don’t have another version of this particular cake. If the sugar you are referring to is the powdered sugar in the frosting, you can reduce it you’ll just end up with less frosting (in terms of volume). I’m sure it’d bake fine as a 6 inch, I just haven’t done it to be able to advise you. I haven’t tried it in a 6 inch pan. I’m sure it’d bake, but you’d need to experiment with how many layers you’d get from the batter and baking time. Hi there I was wondering can you bake the cake in a 6inch cake tin and can you freeze the cake ? I haven’t tried a 6 inch pan, but the cake should freeze well. Just be sure to wrap it well with clear wrap, then aluminum foil. Hi! Thank you for sharing this wonderful cake recipe! Question, for the frosting what kind of butter do you use? And is it salted or unsalted? I typically use Challenge Butter or Land O Lakes Butter and I use salted in my frosting, but you could also use unsalted and add salt to taste. This is definitely the best chocolate cake ever! Thank you so much for the recipe! This looks awesome, but not a fan of Hersey’s chocolate. You must be affiliated with them. You can certainly use a different brand of cocoa, I just usually use Hershey’s. I’m not affiliated with them in any way actually. I do, however, often get questions about which brand I use so it’s included. I love love love this recipe and make this all the time !! The issue I have with the cake is every time I try to stack or assemble it, the cake just crumbles and falls apart. How can I stack and ice a cake this soft and moist without breaking it? Can you do a tutorial on assembling this particular cake? Hmm, it definitely is moist but I don’t usually have trouble moving it around to assemble it. Maybe try refrigerating the layers first. That will firm them up a bit for you to work with them. Love this recipe! 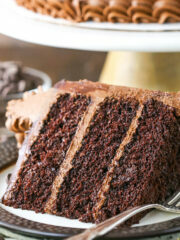 We included it in our list of the Best Chocolate Cake Recipes http://www.listsforall.com/best-chocolate-cake-recipes/ Thank you so much for sharing! Is there a way to use less sugar to make the frosting less sweet? It’s too sweet for me. I use a frosting recipe that doesn’t have shortening, and much less cups of sugar, and it’s still too sweet for me. I’m not sure that I really have a solution you. I’ve seen frostings that use sour cream before. Maybe try looking for one of those to try. That would probably cut down on the sweetness a bit. Maybe this one. this is 2 years late but try using a chocolate cream cheese frosting. it is less sweet and it tastes wonderful! you can also use a flour buttercream frosting but involves more work. you can just google any of these to find the recipe that works for you. Lindsay, this truly is the Best Chocolate Cake! This year I have undertaken to make a birthday cake for each person in my office. Since there are 35 of us an 8 inch cake just doesn’t go far enough. I ended up purchasing 10 in pans so that even the stragglers would get some cake. I made this cake last week but in your Turtle Cake and the consensus was this is the go to chocolate cake. Even those odd ones who don’t like chocolate liked this cake. I doubled your recipe and weighed the three pans to make sure that I had even layers. Unfortunately, the cake had to sit in the refrigerator for two days because I was down with a migraine. AND it was still the best! I also kept the tops to eat because this cake is just to yummy to waste even a crumb. I do recommend using a cake lifter to move the layers because this cake is so tender it could easily break. THANK YOU, THANK YOU, THANK YOU for such a wonderful cake! PS – Your blog is one of the few that I visit regularly. Your recipes are amazing. Hiya! I’m quite confused on the vanilla part is it whole vanilla? And if it is do i scrape the beans off or add the whole thing in the water? Thanks I’m planning on baking this cake for my moms birthday and this cake looks bomb. WOW!! Absolutely everything you want a chocolate cake to be!! I didn’t have any dark cocoa powder left so I used the Fry’s I had and 1 bar of Bakers Unsweetened melted. No adjustment to the sugar and it was perfect! I do believe I’ve covered it with fondant before, but it is a very moist cake. I like to use ganache under the fondant to make sure it’s firm. I saw this recipe and thought “wow” so I tried it as a taster for a potential wedding cake. I followed the recipe to the letter, except I baked in 2 7″ pans and an 8 1/2″ loaf pan. I left them in for 35 minutes, but opened the oven at 32 minutes. When I went to take them out, they were still liquid in the centers. In for another 5, still liquid. Another 4 and I took the rounds out and out and cooled them, leaving the loaf in another 3. After 10 minutes, I moved to a cooling rack, but when I turned over the loaf, it dripped. Everything back in the pans, back in the oven, this time at 325 for 10 mins. The domes are still wet, but what’s below the domes seem done. The batter tastes delicious, and I’m curious what the rest will be like after it cools, but I’m sad it didn’t work out for me. With this being such a thin batter and a slow bake cake, the smaller pan sizes and loaf pan may not work so well. I’d definitely think the bake time would be long. The flavor of this cake was fantastic so, the next time I make it (because I will try again! ), I think I’ll up the temperature. I’ve had success with batters of similar consistencies that are cooked for the same time, but at 350. I’ll give that a shot. I’m a very amateur baker – I enjoy it, but don’t do it often enough – so I don’t know how different factors affect things. Shortening can be replaced with additional butter. I’m glad you enjoy it! I make it as cupcakes too – so good! Does this cake bake up well in as a cupcake? I got a friend wanting some chocolate cupcakes with vanilla buttercream icing. Yes, it’s wonderful as a cupcake. Is this all done without a mixer? By hand? Looks delicious and super easy! Also, can I replace boiling water with hot coffee? And, does this recipe double and triple well? Thank you so much! Im going to make this as a 1/4 sheet cake. Depending on feedback I get. Either way ill try it for the family soon! Thanks for the recipe! ! I usually use a mixer, but you could just use a whisk too. It’s a pretty easy batter to mix together. Yes, you can replace the water with coffee. I haven’t tried double or tripling the recipe, so I’m not sure about that. I hope you enjoy it! It’s all purpose flour. I hope you enjoy it! Thank you so much for the recipies. I’ve been searching for a super moist cupcake/cake. Not easy believe it or not. I made the other chocolate cupcakes the ones with sour cream. They are great. With one exception, the tops seem to flatten after they cool. I would like to try this cake as cupcakes, but not sure how to scale down the ingredients. Could you tell me? Thanks! I just found your book! HI I scanned through the comments trying to find if anyone has tried substituting the eggs. My daughter has a party guest who is allergic to eggs and I was wondering if anyone has successfully made this cake with an alternative like flax eggs? We have made this cake many times and is a favorite. I haven’t tried it and I can’t remember anyone telling me they have. I’m sorry! Hello! I wanna make this for a party but shortening isn’t available where I live. Do u have Amy suggestions what I can use as a substitute?? It looks amazing btw! Is this batter thick enough to mix white chocolate chips into it? I wanted to do a chocolate cake with white chocolate chips throughout and white chocolate frosting for my niece. It’s a very thin batter, so all the chips would sink straight to the bottom. Sorry! This is the best cholcate cake I have ever had! Moist and amazing! I used our Cadbury cocoa. Such a rich chocolate flavour and so so easy to make. I love that all the ingredients are readily available here. Everyone loved them so much that I made another batch the next morning (yesterday). The very best chocolate cake i have ever had and i cannot believe i baked it. I made it into cupcakes as per the s’mores choc cake recipe. I have since made it three times since saturday and it is friday (X_X). I love that the ingredients are readily available here in Lagos, Nigeria. I used Cabdury’s cocoa and it was super rich, dark and amazingly moist. I cant believe i have eaten so many dry choc cakes when such a recipe exists and so easy to make! Thank you so much Lindsay! I’m so glad you found the recipe and enjoyed it! I’ve got just one question: I have 3 Cake pans, but they don’t fit on the same rack… Should I bake them with fan or let one sit on the Counter while baking the other ones? I usually put two pans on one rack and the other below. You could bake the third one separately though. It’s a butter replacement. You can replace it with additional butter if you prefer. The cake looks delish! For the frosting…can I replace shortening with cream cheese? You could. You could also replace it with additional butter. Okay. I never write reviews. N-E-V-E-R, never! Sometimes I think about it when something is good but “This Cake” (which is what everyone at my son’s tenth birthday called it) was the best cake I have ever had! The BEST! So good. Everyone talked about it, the whole day. I got text after text after the party was over. People went back for seconds! Everyone wanted to take some home! Rich, moist yet fluffy, chocolately, not overly sweet but still sweetly satisfying! Ugh, I love it so much! **I did make some adjustments (out of necessity) to the frosting. My son has a mild milk allergy so he can have milk if it has been baked but not raw. The cake part was followed exactly. The frosting however, which I would have loved to use butter in, I had to use a vegan butter substitute and coconut milk. I used Smart Balance. This frosting was still super good. It was a little bit thick and we had some troubles getting it to stick to the cake in some parts. Next time I will add just a little bit more milk and I think it will be fine. BUT!!!! no one could tell that it was dairy-free (this is not always the case). It tasted amazing. Soft and fluffy, chocolate sweetness. I also added a safe-to-eat cookie dough (also made with vegan butter substitute) in one layer which complimented this cake nicely. My aunt told me that I have to make this cake for everything and has decided that we have Cake Sunday’s from now on! I would make this cake over and over and over and over. I’m literally eating the last piece while I type. 😀 <—that's my cake face. Thanks so much Jessica – I’m so glad you enjoyed it! Good to know about the Smart Balance butter too! Hey Lindsay ! I was seriously looking for a fool proof chocolate cake . Though I have made few chocolate cakes before but never with buttermilk. Made this recipe today ( I halved this recipe as i dont have big size tin ). OMG ! I regret that i saw your recipe late while all these years i was searching for one . Came out soooooooo good and super moist . Tons of thanks for such a nice recipe. So glad you enjoyed it! Thanks Sri! Hi Lindsay this is. Great cake!! Just wondering how long does this cake last in a sealed container? And can you freeze it? It’s a very moist cake, so it should be fine for 3-4 days. Of course always best when fresh. I have frozen the layers individually, before layering the cake and it did well. Hi, i followed the recipe as listed but had to bake an extra 10 minutes as it was still runny at 33 min. i frosted the cake and everything seemed fine. when i sliced the cake it was very crumbly. still tasted delicious and moist but the slice did not hold together well at all. First pardon my english, I’m french and while i’m pretty good at reading, I’m not so sure about writing (let’s not talk about the awful accent I must have). I found your blog because I wanted to try my hand at layer cake. Let’s just say that your recipe are fabulous. I made quite a few change since I cannot find all the ingredients you use and I had to adapt to my oven, but thankfully, I found a DIY for buttermilk and Sour cream that work well. I love your chocolate cake (and my family love it just as much). I have a question though : the dark chocolate hershey cocoa powder you use, is it a 100% chocolate? I used Van Houten 100% chocolate (since of course there is no way to find hershey cocoa powder in France…) but the coloring is not the same as yours and I find the very dark almost black colour very interesting (I made the coconut and chocolat layer cake, the black and white would have been great). So after my ranting, I just want to thank you because I can only imagine the amount of work you put in your blog and I wish you luck with your futur baby. Thanks so much Juliette! I’m so glad you enjoyed the cake and the cookies! The Hershey’s Special Dark is actually a blend of natural cocoa and dark cocoa, so that’s probably the difference. It definitely lends a darker cake, but probably not as dark as a purely 100% dark cocoa. I made these into cupcakes and I put too much batter in the cupcake tin, like I always do. I also noticed a few had sunk a little and didn’t realize why until I opened one, and it was slightly underbaked. But ohhhhh boy, is it ever good! I almost think underbaking them just made them more delicious….like a molten lava cake with frosting. Definitely using this recipe again. I’d bake it in two or three pans. It would probably not bake very well in just one 8 inch pan. You were right! I mean, it still tasted delicious, but it took over an hour to bake, making me nervous that it was going to be dry. In fact, it never did bake all the way through so when the center collapsed, I just turned it into a piñata cake and cut out the center on two of the layers, filing it with sprinkles and mini choc chips. At any rate, the cake was a hit and it was still THE BEST choc cake ever! This looks so yummy, can’t wait to make it!! If I’m using 9 inch cake pans instead, do you know how much more time I will have to bake it? If you are using three 9 inch pans, you’d actually bake it for a little less time. If you’re using two, it might be a touch more. I’m not sure of the exact time. Hi Lindsay! Thanks so much for posting this recipe. It looks amazing. Could I make this in a 9 by 13 pan? I wanted to make a cake for my principal because she is retiring. Thanks so much! I can’t remember if I’ve made it in a 9×13 or not, but I think it’d be fine. Hi Lindsay. Can I use the recipe for 2 9×2inches round cake pan with out adjustment? You won’t need to adjust the ingredients, but you might need to adjust the baking time a bit. Hey! I’m about to make this cake, as I’ve made it before and it’s just delicious. I’ve always made it in 8-inch cake pans, but now I’m doubling the recipe and making it into four 9-inch cake pans. And my question is, does this cake batter rise much? I’ve happened to forget, and I want my layers to be about 1.5 inches big. I’m not sure if it’ll be enough. It should rise a good bit. I would think each layer would be at least 1 1/2 inches high – maybe a little more. Absolutely wonderful cake! Lots of chocolate flavor and so incredibly moist. If you have been looking for a moist, rich, amazing, chocolate cake, stop searching and bake this cake immediately! You won’t regret it! I just made this cake and finished frosting it. It’s for my Father in law’s birthday this evening. I made it in 2, 6″ pans and then put the remainder in a 10″ pan as I don’t have 3 pans that are the same size. I was really amazed how much they rose. It took about 45-50 minutes for the 6″ pans to cook through, the 10 inch was done just a bit before 30 minutes. So much that I decided that we would keep the 10″ for us and make cake pops tomorrow. I also had a lot of frosting left so it will be a great project for the kids and I to make together! I haven’t tasted it yet but had my husband and boys try some of the 10″ cake with the frosting. They agree that it’s the best chocolate cake that they have tried! It will definitely be added to my recipes and made many more times! Someday I hope to frost a cake as beautifully as you to! Thank you for sharing this amazing recipe! Can I mix the three 8″ batter pan into 1? My oven is small and it will take too long for me to bake one at a time. You can make it as a 9×13, but not one 8 inch cake. Hi, with this being a very moist cake, is it ok to use for a 3 or 4 tiered cake under fondant? Hi!!! I know this was posted a while ago! LOL. But I was wondering if using unsweetened cocoa powder would work? Probably a dumb question. I’m sort of a newbie here. I make this cake pretty often. My family loves it! I was wondering if you have any suggestions or would change up anything if I wanted to do this with a smash cake? Cook time and would it still be at 300 or a maybe a little higher? Would ingredients change at all? Also, do you have a vanilla frosting that might be good with this? Thanks in advance. I’m not sure what you’d be changing to make it a smash cake? I would suggest this vanilla frosting, but you’d probably want to double it or so. Hi. I love your cakes! I need to substitute the flour for gluten free flour. I have had success using GF flour with a 1 to 1 ratio. I was hoping to change it up and use coconut flour. Do you have any suggestions on recipe adjustments when using coconut flour? Thank you! I’m glad to hear you enjoy them! I haven’t worked with coconut flour, so I’m not sure. I’m sorry! I made this for my daughters birthday last weekend. It was AMAZING! I had compliment after compliment on the cake. Needless to say it ALL went in minutes and the link to you site was sent round as so many wanted the recipe. Thank you so much!! Slowly making my way through the rest of your recipes. Nothing has disappointed so far but this really stood out as outstanding!!! So glad to hear you’ve enjoyed the recipes Chris! Thanks! Hi Lindsay, I made a single 8inch cake with half the ingredients and it tasted awesome! I absolutely loved it. It’s so moist and chocolatey. It’s so soft it crumbles quickly. How did you get such clean cuts when slicing? Anyhow THIS is going to be my go to chocolate cake. Thanks a lot! how tall is your cake? Hi, I am not really sure what’s gone bad with my cake, but at 300, 25 minutes was definitely not enough. When I pulled them out, they were still pretty liquidy in the center. When I look at the instructions, it says to bake for 30-33 minutes. Am I looking at something different? I enjoy baking as a hobby and made your chocolate peanut butter cake for my mother-in-law’s birthday in May and the whole family RAVED about it! As a family if dentists, they aren’t big sweet eaters, so that says a lot! My husband ordered me your cookbook for our one year (paper) anniversary and I was planning on baking the “Chocolate Layer Cake” from there. Being the indecisive person I am, I decided to check your website first and make sure that’s definitely what I want to do. I compared this recipe to the one in your cook book and notice they’re a little different. How do the finished cakes differ? Does the 3 eggs in the cookbook one make for a more dense cake maybe? Thank you!!! PS- Her cookbook is AWESOME!! It’s a great investment if you enjoy baking! I’m so glad to hear you enjoyed it! And that you enjoy the cookbook! 🙂 The cakes are a bit different. You are right that the on in the book is a bit denser. I’m so glad you’ve enjoyed everything! Is this the best cake to use for ice cream cakes? Does it soften quickly out of the freezer? Do you have a good vanilla cake for ice cream cakes? I have a chocolate one that is ok, looking at your to improve my ice cream cakes though ;), but my vanilla is rock hard out of the freezer :(. Yes, I use this one in ice cream cakes and really like it. As for vanilla, I often use a vanilla version of these cake layers. Can you delete my last name from the post please? looks perfect! Can I use this for fondant icing? Many thanks! OMG Lindsay… I used this cake recipe along with your ganach filling from another of your recipes and then my own icing variation to make cupcakes for a coworkers birthday. They turned out to be awesome. One coworker said they were “one of the best cupcakes I have ever eaten”… I was also told it was like heaven in your mouth. They were light and not too overwhelming as most triple chocolate cakes are. Thank you for the wonderful recipes… I want to make all of them!!!! So very happy I found your blog. Sounds wonderful! So glad you enjoyed it! Thanks Beth! Making this cake tomorrow and am wondering, is the boiling water/vanilla mixture added while it is still that hot? Or are you supposed to let it cool a little. Going to make this cake with your vanilla frosting per my grandfathers request and will be trying a ganache on top for the first time! Hoping it turns out as well as the milk and cookies layer cake I did for my dad!! Yes, I add it while still hot. I hope you enjoy it! Glad to hear you enjoyed the milk and cookies cake – love that one! sifted powdered sugar or straight up 9 cups of sugar???? Hi Karen, I have a few posts that talk about my frosting and why they are the way they are. They are pretty standard decorator’s buttercream, but feel free to check out this post and this post. Hi Lindsay, I’m going to try the cake soon. It looks amazing. One question , can i use whipped cream frosting? As long as it’s a stabilized whipped cream, it should be fine. I’ve never made a cake from scratch before but I am an artist and I want to make a cake for my boyfriend for his graduation party. I want to make this chocolate cake but I want the icing to be a deep red because it’s going to be a motorcycle theme. I’m wondering how you think it would taste to use your recipe for vanilla frosting and this chocolate cake recipe? Hi! Love your blog! I’m making this cake for a friend on Thursday to enjoy Saturday. Would you recommend freezing Thursday night to defrost Saturday or just simply refrigerating? I know that some chocolate frostings “sweat” when left out, do you find that with this chocolate frosting recipe? Just want it to be perfect! Thank you! Are you making the entire cake on Thursday, or just the cake layers and then building the cake on Saturday? If you’re making the entire cake (frosted and all), you should just be able to refrigerate it. I only notice “sweating” when a cake is taken out of the fridge and allowed to come to room temperature, but in my experience it doesn’t really cause any issues. I hope you enjoy it! It’s been a very long time since I made a tiered and/or fondant covered cake, but I do believe I’ve used this one for that before. Dark cocoa, please. Also, if I can’t find it, can I just use regular cocoa powder. Thanks in advance. I’m not familiar with Dr Oetker’s Dark cocoa. I’d probably go with the regular unsweetened cocoa. I’ve just been informed by my dressage instructor that in France you will most likely always see a chocolate cake at the stables/barn. The reason? If you fall off the horse, you must bring a chocolate cake the next time you come for a lesson. Well…guess who’s taking a chocolate cake on Wednesday? LOL I have a quick question…can I use cream/heavy cream instead of milk? Hey! How much of this recipe would I have to make for a 10” cake with 3 layers? I’m not really sure. You’d probably need to experiment with it. This cake was AMAZING! I was wondering if you could recommend a yellow cake recipe of yours that has a similar texture? thank you!! So glad you enjoyed it! This is the vanilla cake (the cake layers) that is kind of modeled after the chocolate cake. Some people have had trouble with it though. This is my newest vanilla cake, which I would say is similar is moisture and texture. Hello I have a question that nobody has ever answeared me. I would like to know why my cake never looks like yours all even and each layer equal. Mine is more like a dome. Thin in the edges and up in the center? ???? help! The majority of cakes will bake with a little dome on top. To get the cakes flat, they have to be leveled with a sharp knife. I’d say 1 1/2x and yes, leave the oven temperature as is. You’ll probably need to bake a little longer, just keep an eye on it. I have found your site just yesterday,and i though ohhh nooo(in a positive way):):). But i can not believe that you look so good and you make all this sweet and beautiful things haha..
1.i have only normale dutch cacao..its written 100% cacao unsweetend…its verry dark.and because i didnt knew what is dutched and regulsr cacao ,so i have looked on google…and i still dont understand one thing because there was written something like that the cacao that i have that i must better use baking powder instead of bakingsoda…something with ph sour or something…so what do you reccomend just stick with your normale recipe and use backingsoda or backing powder? The cake spring or how do you say that ,the thing where ypu put the batter in…there is writting 8inch and i have looked it up and there was that is 20,something cm is that writ yes? Greetings andd thumbs up for you beautiful site. You can use 100% unsweetened cocoa, that’s fine. Still use the baking soda. And liquid buttermilk is fine. I use the powder, but they are interchangeable. 20cm sounds about right for the pan size. I hope you enjoy it! Hi Lindsay! I would love to try out this brilliant recipe of yours, but is there anything I can substitute for the buttermilk as I can’t find buttermilk here in my place. Yes, you can use regular milk as well. Good day, Lindsay! Thank you for the prompt reply 🙂 Will definitely try out this recipe! Hi Lindsay can i use normal coco powder instead of Hershey’s dark coco powder? And i want to use fondant to cover the cake, will it work? And would it have a weird taste? Yes, regular cocoa is fine. Fondant should be fine on the cake and taste would depend on the fondant you choose to use. Just wanna say your recipe is amazing thank you so much. Since I saw the recipe I’ve done the cake thrice and just this week i replaced the chocolate frosting with a light whipped cream frosting and it was soo delicious. Love it. Hi Lindsay.. I live in South Africa and Dark Cocoa powder isn’t easily available.. if I use normal unsweetened cocoa powder must I adjust the quantity of sugar used? Nope! You can just swap it out! Enjoy! I tried making this cake using the metric measurements the first time and found the sugar and flour measurements (especially the flour) completely off. The flour was supposed to be 300 grams according to another conversion site, yours says 260 but when I measured it the conventional way (cups) it measured in grams at 341 grams. So I was wondering when you measure and convert do you check or do you use a conversion tool. My first attempt was pretty runny even before I added the hot water. The sugar was a bit off too. I loved the cupcake recipe which is why I wanted to give this one a go. The measurements aren’t off. If you look at a number of conversion sites, they rarely show the exact same measurements as another site, so comparing my numbers to theirs will be different. People also measure cups differently all the time, which is why weight is more accurate. I use the metric conversions myself just as they are written every time I bake this cake and they are correct. The batter for this cake is VERY runny. How much was the weight of the cake? I made this over the weekend. I baked at 350 for 30 minutes. Came out beautifully, but it cracked. No big deal, until I tried to frost it. It fell completely apart. I had to throw in all into a trifle bowl and call it dessert. What happened? Great cake just didn’t hold together. It’s definitely a tender cake, so you want to be careful with it. I know the recipe is listed at 300 degrees though, not 350. I personally find that baking it at 350 changes the texture of the cake, which could have contributed to your problem. Thanks! I’m going to try it again at the correct temp. Hubby loves it! Says it reminds him of a SuzyQ, back when they were good! HA! I made this cake for my son’s 25th birthday. He LOVES chocolate! I’m going to tell you this is, without a doubt, the best cake i have ever made! 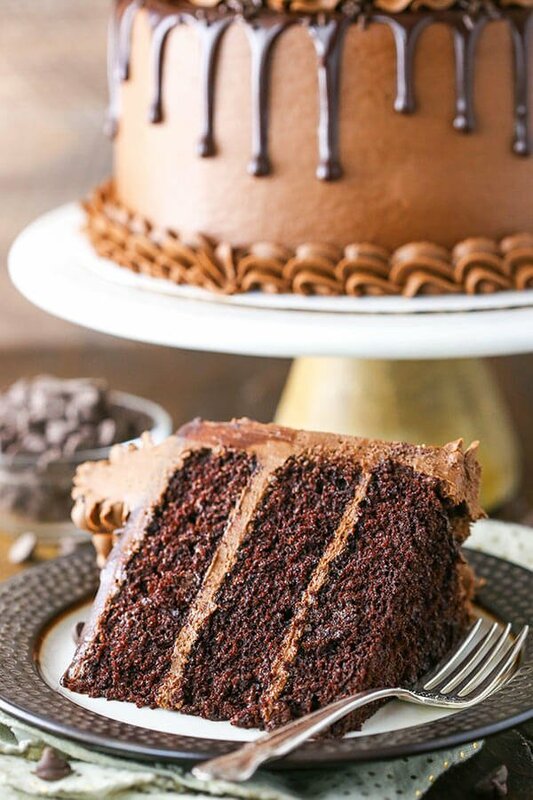 Its soo moist and tender and VERY chocolatey! Thank you so much for the recipe and i also enjoyed your vanilla cake recipe that i made for my family picnic! I would prefer not to use vegetable oil, can I replace with butter or coconut oil? Would the measurement remain the same? I haven’t tried it with either of those, so I’m not sure. hi Lindsay !!! My name is Silvana and I’m from Argentina. I ended up here because a friend tagged me on your famous baileys and chocolate cake????. I was reading the recipe but I have a problem: here the buttermilk doesn’t exist. what can I do? thanks???????????? Hi! First, thank you for sharing your recipe. I attempted to make it for Father’s Day. It tasted amazing, and was very moist. My only issues were that my layers seem to bake too thin(almost like a brownie), and it stuck to the pan. Also, the layers broke upon removing them from the pan. I was able to reassemble 2 of the layers, and hide my mistakes with frosting(haha), but the 3rd layer crumbled beyond repair, and I decided to throw it in a bowl, cover it with ice cream, and eat it myself. I must admit that this was my trial run of making this cake, and I’m planning to bake it again for an upcoming dinner party. I wanted to get advice on where I could have gone wrong, in regards to the layers baking too thin, and the cake crumbling? Does the quality of the baking pan affect the way a cake comes out? I’m asking because this was the first time using the particular set of cake pans that I used. Again, the cake tasted amazing, and I’m sure my issues were the result of something that I did wrong. Hmm, I’m not exactly sure what would cause that. Did you open the oven much during baking? That lets out heat and can cause the cake to fall. The cake pan itself might have an effect, but seems unlikely. I use light colored Wilton cake pans. Hello! Love this recipe and excited to try it out! Quick question…if I made the cake layers a day or 2 in advance, would you recommend i refrigerate them until ready to assemble? Also, do u refrigerate the cake after doing a crumb coat? I personally wouldn’t refrigerate them, I’d just keep them in an airtight container. And I don’t usually refrigerate after the crumb coat. I honestly only refrigerate cakes when truly needed – like with certain fillings and frostings. The cold tends to dry out the cake. I’m really sure. I haven’t worked much with substitutions. This truly was the best chocolate cake that we have evee had. Thank you for sharing! This looks absolutely delicious! Do you have any high altitude tips for this recipe? Thank you so much. I want to make this for my birthday! I don’t really know much about high altitude baking, I’m sorry. Hi Lindsay, first time to see Your blog and really loves to try this recipe. But i have some concerns regarding on storing the cake (i mean the cake + the frosting). i really dont much any time to make this. We will celbrate my uncle’s bday on Saturday and i am planning to do it on thursday. Would it be the same taste, consistency, etc. after 48 hrs in the refrigerator? What are Your recommendations for storing it? Thank you very much! I generally make cakes the day before. Two days before should be ok. Either would be good, honestly. And both are great for piping with. The fudgy frosting is just a new one that I’ve been enjoying. You can find the measurements I use for a full cake on this raspberry chocolate cake, if you’d like to use it with this chocolate cake. Hi love the recipe your chocolate cupcakes vanished in a day! Just a quick tip which might stop people from having my disaster with this recipe… use a cake pan that doesn’t have a detachable base! It went everywhere!! Why can’t I “pin” this??? Hi Sheila, I’m not sure why you’re having trouble. Everything should be pinable. If you’re still having trouble, here’s my pin that you could pin from. Love, love, love this cake!! It’s turned my family into dessert snobs – nothing measures up! One question though – I tend to have a hard time getting the frosting to stick to the cake, particularly on the sides. Any suggestions? I’m so glad to hear that! It sounds like the frosting could be a little too thick. I’d add a little more water or milk. Here’s a post I have on frosting consistency that might help. Aaaaaand I have a new go-to chocolate cake recipe. WOW. Easy to prepare but anything-but-basic results! The moist, tight crumb is perfection and the depth of chocolate flavor is on point. P.S. Chocolate cake has never been a #1 go-to for me…I’ll typically pick anything over chocolate unless it’s a brownie. THIS cake is a shining STAR, though. The result was a beautiful “black & white” cake topped with fresh raspberries. But the star was undoubtedly your perfect chocolate cake recipe. Readers, look no where else. THANK YOU Lindsay. Thank you! I’m so glad you enjoyed the cake! I made this cake last weekend and it was fantastic. I made it for a birthday party and it was a big hit!! Thanks so much for this awesome recipe!!! Hi Lindsay. I want to make this cake for my sons first birthday…for the adults, I have a smash cake already planned for the birthday boy. Question. If I was to bake this in a 9 inch pan one layer at a time, what would be the cook time? Thank you. Can’t wait to try it out! HI Lindsay, as you know I love and use a lot of your recipes sweet lady. I used your moist chocolate cupcakes for Halloween. Everyone loved them. Now my daughters birthday is this Friday and I am making her cake she said she wants the chocolate cake I used in the cupcakes is this the same but in cake form? I want it to be very dark like the one in the photo. Also dark frosting as I am doing it as a mirror cake she hasn’t ever saw one, so I thought I would make her one. I have done the mirror glaze on frozen mousse, but never on cake they say you can use it on buttercream cakes that have been frozen 2 hours. 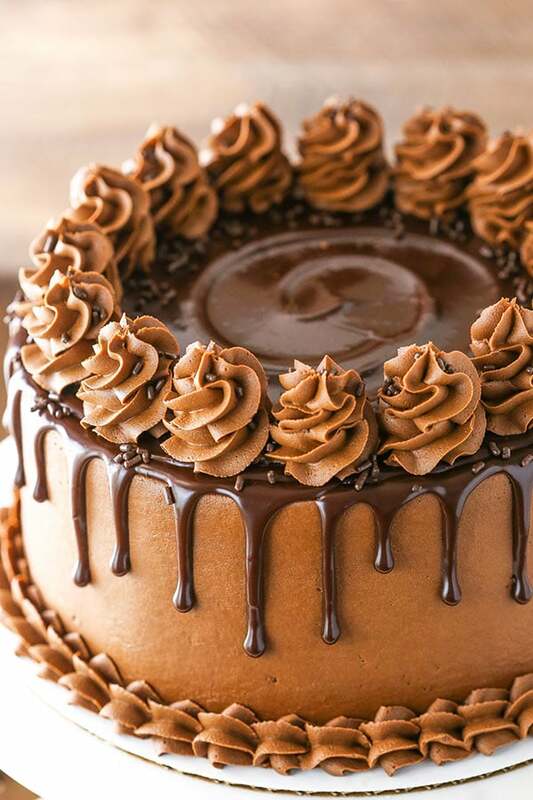 Could you use this cake and your buttercream listed here to freeze it 2 hours after putting it on the cake, before putting on the mirror glaze or would it effect the texture and taste of the buttercream? Thank you for always helping your cakes are beautiful love them all. Sorry for my delay, Debbie. This is the same cake as the moist chocolate cupcakes. 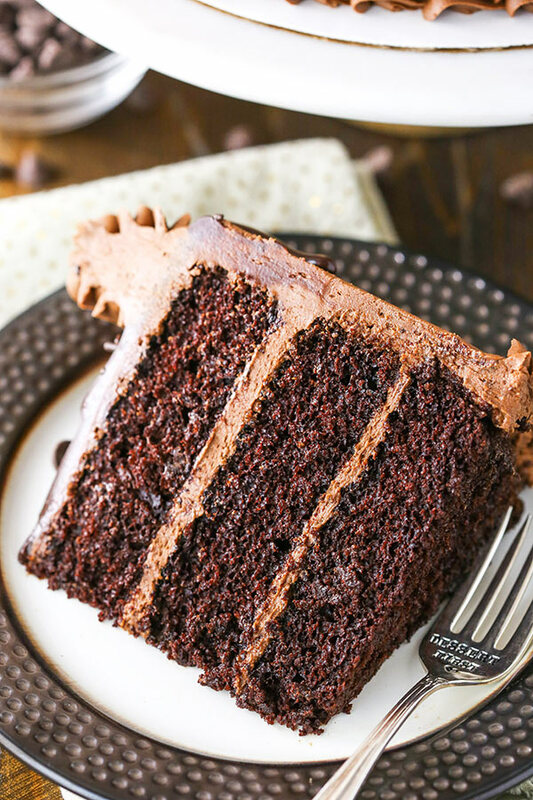 The cake in the photos is especially dark from using the Hershey’s Special Dark Cocoa. Freezing it for a couple hours should be just fine. I’ve never made a mirror cake, but so fun! I hope she enjoyed it! Thank you Lindsay, she loved the cake and it turned out beautifully. Such a wonderful recipe I can very well see why the lady wanted you to make them for her business. This cake is so delicious, everyone loved it. Thanks again for all your wonderful recipes. Can you use viva paper towel to smoothen the chocolate buttercream? It’s fine either way. For simplicity, room temperature is fine. Hi! I’m drooling over this recipe and will be making this cake for Thanksgiving….I’ve been craving something very chocolatey and light. Any recommendations for a lighter frosting like whipped cream or chocolate mousse? I’ve never made a cake with either before but this recipe sounds like it would go great with light frosting. I think either would work. For a mousse frosting, check out the frosting recipe for my Chocolate Mousse Cake and for a whipped cream frosting, check out my tutorial on whipped cream. I hope this is helpful! Hi Lindsay, You have been so helpful in the past and I made this cake for my daughters birthday and everyone loved it. So thank you. But I have been asked to do a cake for an adoption celebration and I wanted to use this cake, they want a two layer sheet cake the sizes are for the bottom 12″ and for the second layer 10″ my question is how much cake batter would I need for that size cake? I have made sheet cakes before but not layered and not that big. I am hoping it turns out well for them such a great celebration. I hope your still reading older questions I need to find out as soon as possible they want to pick up the cake Dec 7th. Hey Debbie, I’m sorry but it’s been years since I’ve made cakes that size and I truly don’t remember. I hope the cakes turn out great! Adoption is such a great thing! Hi, how does this recipe compare with your chocolate mousse cake which I have made and everyone loved? Thank you. They are actually fairly similar cake recipes, but I’d have to say that this one is my favorite ever. 🙂 It’s even more moist and tender. have you ever tried to make it using half brown sugar? I haven’t, but you could. Thank you for reply. Very much appreciated. I will definitely give this a whirl. Hi there! This looks like a to die for chocolate cake!! How could this recipe be adjusted for 3 6″ rounds? I haven’t tried it in a 6 inch pan. Your chocolate cupcakes are my go-to recipe – they are incredibly easy to make and taste divine. Now I want to make it in the cake form but I have a question – I only have 2 cake tins but I really want to make 3-tier cake. Will the batter hold while the first batch is baking or should I make it in 2 batches (2/3 and 1/3)? Thank you! I’m so glad you enjoy the chocolate cupcakes! And yes, the batter should be fine while you bake the first 2 layers. Thank you for the reply and Happy Holidays from Sweden! I have been making this cake for years. This is basically the Hersheys dark chocolate cake and I see a couple substitutions that you made. Instead of milk. You use buttermilk. You increased and decreased the baking soda and baking powder. You did change the frosting slightly. So, give credit where credit is due. I have this in my Hershey’s cookbook. I made this cake for my cousin’s birthday this week. She specifically requested a triple layer chocolate cake so this recipe was perfect. I completed it with a lavender colored marshmallow fondant and lots of sprinkles and the end result was a hit with the entire family. They all raved about how delicious and the moist the cake was! How it is that The Best Moist Chocolate Cake requires no baking powder only baking soda, and the Easy moist chocolate cake has both baking powder and baking soda? When I made the Best moist Chocolate cake it did not rise to a nice height. They are different recipes with slightly different textures. Baking powder is not required for a cake to bake properly, especially not a chocolate cake. A lot of chocolate cakes only have baking soda because of the way it interacts with the acid in the cocoa. The cake should rise just fine, I’m not sure why it didn’t. I’m sorry you had trouble. No worries. Thanks for the reply. The cake taste good, maybe I will use two pans instead of three pans the next time. I would give this recipe 10 stars!!! I bake a lot and this is the best chocolate cake I have ever sunk my teeth into. I made it for my husband’s birthday and it is a winner, he loves it too. I made it as you listed with the exception of adding 1 tsp. of baking powder, i used buttermilk powder instead of buttermilk and I baked it in 3 9-inch pans. I used Hershey’s Special Dark Cocoa Powder also. I had to bake it for 4-5 additional minutes. I filled and frosted it with chocolate whipped cream frosting, which is perfect for this cake. My husband and I don’t like very sweet frostings. The cake is lighter than air, it really melts in your mouth, it is so moist and chocolaty. Thank you for posting this recipe, it is the only chocolate cake I will bake now. This cake looks amazing. It is my daughter’s 50th birthday, and I am going to make it. I pray it comes out as is in the pic. I’m a little concerned how one member made this cake, and said her cake sunk in the middle, I don’t want this to happen! Any suggestions on help with this cake will be a great help to me, but need it asap, as I am making the cake tomorrow! The best bet is to follow the recipe. I would also recommend not opening the oven too soon before the cake sets, that may make it sink. I hope you enjoy! I made the cake this morning for my daughter’s 50th birthday on Wednesday. When I took the cake out of the oven, I left them on the side for 15 mins, I then released them from the cake tins, and left them for a further 6-7 mins. So I made the ganache/icing, so put one half of the cake on a plate, then the cake started to crack on the top for a bit, any way, i put the ganache on one half of the cake, then added the second cake on top, it too started to crack on the top of the cake, I did get a bit anxious, so I continued completing it all. The actual cake is lovely, ..just my icing is not the best.! Many thanks for the recipe, I’m sure I will do better next time! I really haven’t worked with egg substitutes, I’m sorry. 9 cups of powdered sugar for the frosting? I’ve made this cake a few times already, and it is the best chocolate cake recipe I have ever made by far. I used coconut oil (warmed up just a tiny bit to get it to liquefy) instead of vegetable oil, and it worked so well and was so rich! THANK YOU!!!! I am the WORST BAKER in the solar system, hands down. But that doesn;t stop me from trying to better myself(lol I made this today and only changed up the hot water with a cup of plain hot columbian coffee! Baked it in 9 X 13 GLASS PAN for 50- 55 minutes @300. this cake came out perfect!!!!! BUT TASTE WAS LIKE HOLY WOW!!!!! MOIST, PERFECT FLAVOR AND OMG, LIKE AUNTIE USED TO MAKE! I even made homemade buttercream frosting, THANKS FOR SHARING THIS RECIPE! This cake looks amazing and I can’t wait to try it! What would you recommend doing to the recipe for 3 9″ cake pans? Thank you so much! I’d reduce the baking time – try checking it at about 25-ish minutes, then add a little more time, if needed. The cake layers will be a little thinner. Can this cake be covered with fondant? Can i make the cake in advance and how many days in advance can i make it wnd it still tasye good? I really don’t have a ton of experience with fondant, so I’m not sure I have the best advice. When I did work with it a bit, I found most cakes were fine if I used chocolate ganache on them. If I used buttercream, the corners often didn’t stay nice. This is a very tender cake. This cake lasts very well for 3-4 days, assuming it’s well covered – even better if it’s frosted.